The decision to move the embassy upended decades of Washington policy and sparked heavy criticism in the Palestinian territories and beyond. JERUSALEM — Ivanka Trump, Jared Kushner and other members of the U.S. delegation arrived in a tense Jerusalem on Sunday to celebrate the relocation of the United States embassy. President Donald Trump recognized the city as Israel's capital last year and pledged to move the U.S. Embassy there from Tel Aviv. The new embassy is opening in part of a pre-existing American visa-and-passport facility and will have an initial staff of at least 50, according to senior Trump administration officials previewing the highly anticipated opening. That includes Ambassador David Friedman's aides and U.S. consular officers already working at the site. Around 800 guests are expected to attend Monday's event. There will also be events on Sunday to celebrate the move, though many European nations who oppose the decision are expected to skip them. “This move marks the end of an era when the United States led international efforts to supposedly achieve the two-state solution,” said Husam Zomlot, leader of the Palestinian delegation to the United States. The Trump administration, Zumlot added in a statement, had acted in a “divisive manner” that would help the “minority anti-peace forces” and further erode the rights of Palestinians. Gabriel Meital, who lives in a kibbutz near Tel Aviv and like many Israelis welcomed the move, said he was a little worried but believed the move was "the right thing that has to happen." Meital said he was "sure" there would be civil unrest in response, but felt it was a price worth paying. "Jerusalem is the capital of Israel and I think all the embassies must be here, in the capital of Israel," he added. Not only is the embassy ceremony expected to be met with public unrest, the next day is the 70th anniversary of what the Palestinians call the "nakba," or catastrophe, when hundreds of thousands of people were uprooted during Israel's creation in 1948. 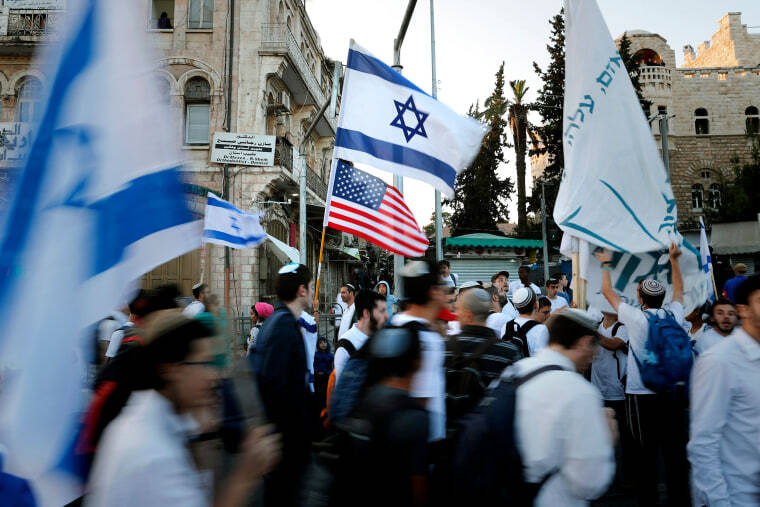 Furthermore, on Sunday Israel marks Jerusalem Day, the 51st anniversary of what it refers to as the city's "unification" following the 1967 Mideast war. It will also be hosting a gala reception for the U.S. delegation. "We want to make sure that one event doesn't lead to another, meaning that if today things will be quiet in Jerusalem then of course hopefully tomorrow things will be quiet as well," he said.